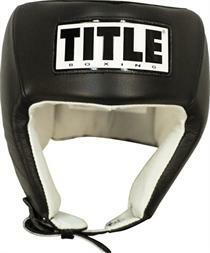 "USA Boxing and Golden Gloves approved for your big fight! Top grade leather shell with reversed, ultra comfortable suede leather liner. Multi-layered, laminated high-density padding. Air channels for extra ear protection. Fully adjustable lacing system on top, back and under chin. Made to fit your head like a glove. Expertly crafted to help protect, yet not interfere. Small 6-5/8" - 6-3/4" Up to 132 Lbs. Medium 6-7/8" - 7-1/8" 135 - 165 Lbs. Large 7-1/4" - 7-1/2" 165 - 190 Lbs. X-Large 7-1/2" - 8" 190 - Super Hvywt. Email your friend about the Title Competition Headgear W/O Cheek. Ask a question about the Title Competition Headgear W/O Cheek.